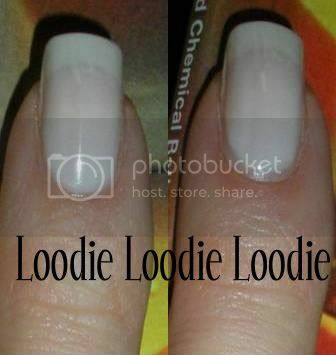 loodie loodie loodie: Do you want longer nail beds? Okay, in my strange world, one of my favorite things to do, besides shoving my face, is pushing back my cuticles. In today's post I am going to demonstrate why it's so gratifying. When I first started caring for my nails, I didn't know how take care of my cuticles, paint very well or barely file, but one thing I did do, which completely (in my opinion) changed my nail beds, was push back and massage my cuticles. I had very short wide nail beds that were pretty triangular in shape. I wish I had a before picture. The best I can do is a scanned image from 5th grade, but it would be so blurry it would be pointless. So, just close your eyes and think hobbit fingers. Alas, I do have pictures to show you. Maybe I can convince you of getting into the habit. It's addicting! 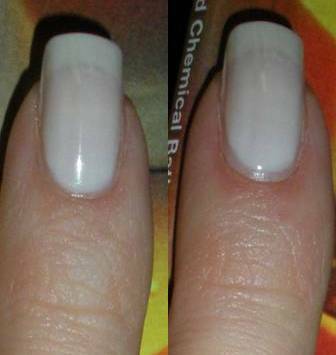 Here is a before and after shot of pushing back the cuticle area. How can you not love gaining some nail bed??!! I admit at this point my nail bed revelation is not as dramatic or permanent, but still useful. I will push back cuticles right before I paint them to get closer to the cuticle without flooding it. Although I say this trick is not permanent per say it was at one point. Compared to what they looked like before I started doing this on a regular bases till now, I have seen a complete change in my nail shape and nail bed length. At this point this seems to be the maximum to where I can take the cuticle. Here is a before and after of my pinky. 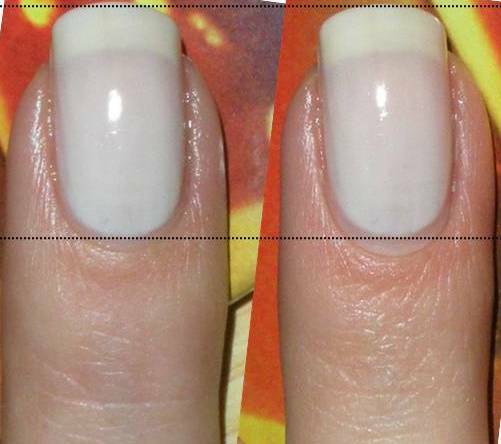 Massaging this area as you push them back will stimulate an important part of the nail where the nail grows out. Massage stimulates more blood flow to the area and promotes healthy growth. Your nail tips and toes are the farthest away from your heart so the more you can help them out the better. It may even promote faster nail growth, but I have absolutely no scientific proof of this, I just like to believe it. I massage and push my cuticles back a couple times a day. I know a bit obsessive. You don't need anything special and can do it pretty much any time. If you are new to this, I would suggesting being gentle since your cuticle area may be sensitive. The best time to push them back is after a shower. They are soft and pliable. You can use either just the pad of your finger or place a towel between the cuticle area and the pad of your massaging finger. The towel will create some friction to help push back the eponychium and may help remove some of the true cuticle. You can also do this with or without cuticle moisturizer through out the day. Again, I caution being gentle if you are new to pushing back cuticles. Massage the area in circular motions, C motions following the shape of your cuticle or up and down the nail shaft. Go WILD! Until you are comfortable with this skip the implements to avoid poking yourself unnecessarily or injuring the nail matrix. The more often you do this the less they will move each time and the more permanent the revealed nail bed will be. Do you want the opposite of longer nail beds? Crazy right? Why would you want that? Find out why and how in this post. :) I do it once a week, on "Manicure day". Yeay to all the cuticle pusher addicts! I really have pathetically small nail beds, I am definitely going to try this! Mine are really short, too. No amount of pushing is gonna change that! @Mena - definitely see what you can gain! Ok...a year late, but I grew up learning to do this from my mom. And I do it several times a day also. Always when putting lotion on and sometimes just for kicks and giggles! I have very long fingers, so my nail beds are already fairly long. I still like to push my cuticles back because I love how it looks! My fingernails are quite long, so I don't push back my cuticles, but my toes are rather stubby... :P so I tried pushing my cuticles back and I am AMAZED! at the results. My nail beds are like 50% longer, and look hot! 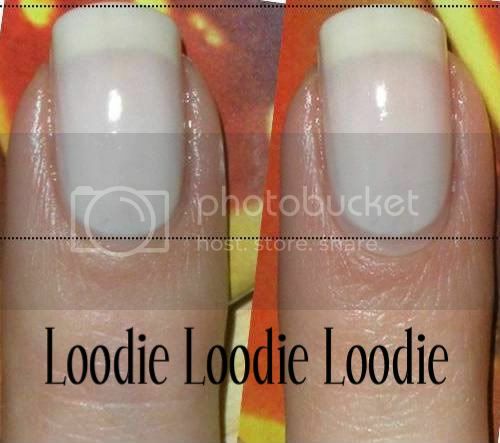 Loodie, finally I got some skin that grow up under the nail free edge. But just in the middle of my nail, not at the side walls (my manicure and I still fille them :$). What can I do to have a 'smile', not a V nail? How can I stimulate this skin at side walls? I also noticed I've been getting fewer hangnails! well i have seen so many interesting points in your reviews. and i have noted all of them as well. I have recently stopped biting my nails and started loving the world of nail polish, only the paint my nails and then remove everything in frustration because I'm frustrated with my hobbit fingers, just like you describe. This post gave me hope that I can change the size and shape of my nail bed with some diligent cuticle maintenance. Thank you!! What happens when the skin under the nails kind of seperates from det skin? Every time I see a little growth in the skin underneath, it suddenly detaches from the nail and my nailbeds get shorter. Why does this happen? How can i stop it? What do u use to massage ur nail beds? Olive oil or something? This is very interesting info. I am definitely going to try this to get my skin to attach to my nail further down my finger, especially the part to not use any hard object like a file or orange stick to clean out underneath. Thanks!!! !